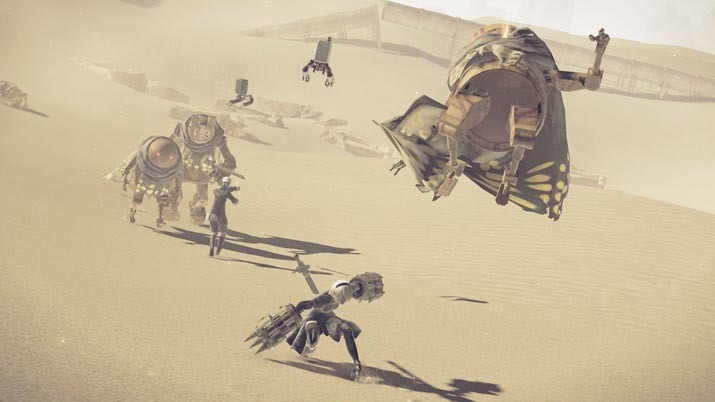 NieR: Automata is an ARPG with emphasis on a hack-and-slash mechanic. It is set after aliens have invaded the earth, presenting a post-apocalyptic, post-human theme. Post-human in the sense that what remains of humans on this planet is but a trace: for example, skeletal remnants of infrastructure still stand, but barely. NieR: Automata begins with a voice espousing a cryptic puzzle and philosophical paradox regarding life, questioning if the fact that everything that lives is destined to come to an end is some cruel joke or punishment. The voice expresses her animosity by saying that she hopes there’ll be a chance to kill the god behind this. You begin by piloting an air vehicle in a Galaga-style battle. Soon it becomes a twin-stick shooter with bullet-hell elements such as changing camera angles that leave you surrounded by enemy ships on all sides, forcing you to evade their attacks in 360 degrees, a far cry from classic Galaga, where the enemies are simply in front of you. The camera angle will change often during this initial flight, so a quick eye and good hand-eye coordination are needed for swift adjustments. After the ship crashes, you find yourself switching from air battles to fighting on the ground with a sword. Enemies vary from low-level machines to ones that pilot a small air vehicle, shooting red orbs at you. Eventually, you'll run into a few boss-like creatures: some while on the ground, others while airborne, hovering over an ocean. You never have the opportunity to kill any of these; occasionally, 9S, another android, will arrive and join you in battle, saving you. 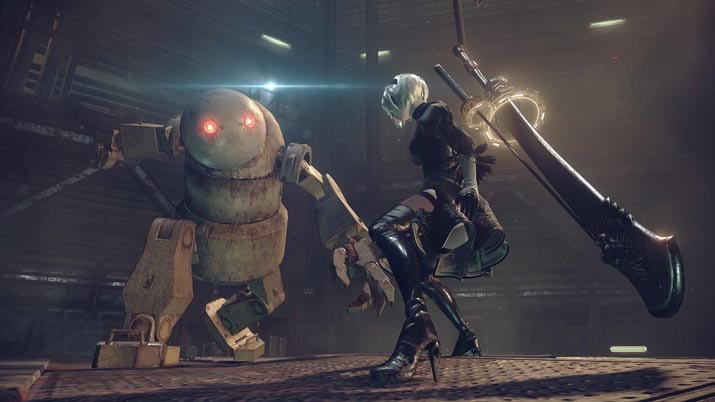 There are two ways of viewing the release thus far, and these are not mutually exclusive: as an introduction to the mechanics of different types of battling and boss fights; and that 9S' interruption serves as a deus ex machina. The bosses are a higher level than you, but that does not mean defeating them this early is impossible - hardly. Being presented with a god-like (in size and strength at least) automaton, just to be pulled away mid-battle, is misleading and perhaps a crueler joke than the fact that everything that lives is destined to come to an end. You have the chance to kill a god-like creature, which is maybe the closest you get to "kill the god behind this," but then you are not allowed to finish the fight. Setting that issue aside, there is a great sense of achievement a player feels from defeating such a huge boss. They are overwhelming this early in NieR: Automata, so someone who may not be used to this combat style may find these bosses frustrating if defeating them, with no assistance whatsoever, were demanded. It's a double-edged sword, and will come as a dismay to some, a deep relief to others. Ultimately, this introductory level may, in fact, show you that this release is manageable, regardless of what NieR: Automata might throw your way. The story is a bit lackluster, particularly given that 9S’ personality falls flat; nor is what he ons to dialogue more offputting than engaging. Rather, what he says is out of character when you compare it to the type of person he portrays or claims to be. He comes off as a soldier in training who is soft-spoken and shows no assertiveness from his tone. He calls 2B “ma’am” constantly, and 2B almost cringes at this formality; him calling her by this title comes off as signifying deferential authority, where 9S appears lower in rank than 2B. He calls himself a badass and states that humility is unknown among his kind. Actually, he is nearly the same rank as 2B — they fight alongside each other — and his hacking skills are superb. The quests are of the 'fetch' or 'kill some of these' types, which help keep the story to nil, and detracts from a more fulfilling gaming experience. The cutscenes in the first few hours of play are not memorable; heartstrings are not tugged. This absence of an indelible story for at least the first several hours might discourage the plot-seekers from truly enjoying NieR: Automata. 2B, the woman you play as, is indisputably attractive - she may be the epitome of beauty: her ability in combat, combined with her stunning physique, make for just about any gamer’s ideal heroine. She is not entirely emotionless, either, despite being an android and despite her stating that emotions are prohibited. Although her emotional moments are sparse, when she does emote, it is beautifully executed, endowing her with just a tinge of humanness that allows you to empathize with her, if but only in the fleeting moment. The melee-range dual combat system is interesting — you can either attack enemies with swords, use your pod for ranged support and attack from afar, or do both. Relying on this ranged support somewhat takes away from close-quarter combat; it seems to function as a substitute, and only complement the close-quarter battles when taking on multiple enemies at once and you are surrounded by them. You could just kite a group with ease, take on an enemy ten levels higher than you, if there's an obstacle in the way (or even apply this tactic to a boss fight). Of course, you are free to not use the pod at all. The opacity of the orbs it shoots obstructs what the enemy is doing, and it is good to know if the enemy is currently attacking or not so that you won’t get hit. I searched the settings for some opacity parameter, but did not find any. Alternatively, you could cease firing with your pod for a split second or two, to see what a mob is doing. 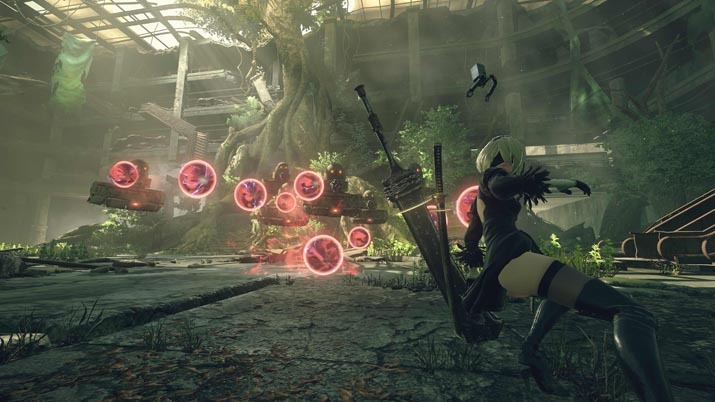 9S’s combat tactics can be adjusted as one sees fit, but regardless of what how you designate him to fight, he will not engage an animal and assist you. He just runs around, following you, acting as if there isn't a fight in progress. He comes in handy during "real" fights, particularly when set to close-range or aggressive. He'll storm the opposition, may cause some enemies to stagger, then that's when you can come in and clean up with ease. There is a bit of a quick-heal option that is worth utilizing, as recovery items are not the most common loot to find, (but they are cheap): simply save, then load the save — you'll be at full health when you return. Once you figure out when an enemy is about to attack, combat becomes rather predictable. I switched the difficulty from normal to hard , but the most immediate difference was enemies seem to hit harder (one killed me in one hit while I was at full health), as opposed to less predictable or more varied moves. There are not many varied enemies; from the start to the amusement park, you encounter maybe a few that are noticeably different; some are just variants of what you’ve faced prior, whether they’re stacked and taller, or dressed in some amusing garb at an amusement park. Some bosses are spectacular, and each is different from the last; but, even these enemies have predictable moves. I did have trouble attempting to face a boss that was five levels higher than I, and when I died, I respawned at the start of the fight. 2B’s stats were too low to handle the boss, so it was futile to attempt again. Attacking close-up is still a delight, given that you still need to make proper and quick use of evasive tactics. Escaping any up-close fight unscathed is an accomplishment, as it requires deftness; careful, cautious approaches; and planning. 2B's agility, mixed with being so proficient with wielding a weapon is enjoyable to utilize and watch. That is the question you must ask yourself: 2B or not 2B a machine-destroying badass. You may conjecture that that is what her name means, too badass. All I know is: I wouldn't mess with her. At the shops in the resistance camp, you can buy various weapons and upgrade them, but this latter option requires materials and money; some weapons you may find out exploring. There is no armor in the title, as you may expect from an RPG, but your defense will rise as your level does; likewise with your other stats, except for your ranged attack (upgrading the pod increases ranged attack). Lack of traditional armor is where the plug-in chip and pod programs (which act as a skill) prove useful. You can buy both of these, or find at least the plug-in chips as loot; you may also fuse chips together. These chips help offensively or defensively and increase overall functionality, such as granting a 'vampiric' heal — really called "offensive heal," where you recover two percent of damage you deal back as HP. The only limit to what you can equip is the cost of the chip itself; more powerful chips occupy a greater number of slots. Likewise with pod programs, although you can only equip one of these, as they range from spears shooting up from the ground to activating a shield around you; although, these have a cooldown. Fishing and crafting systems are available (the crafting system allows you to upgrade your weapons in exchange for the proper materials), and you can fish wherever there is water; you don't need to find or buy a pole or fishing bait. You can sell what you catch, often for a rather large chunk of change: some items range from 2,500 G to 7,500 G. It is peculiar that the fish you catch are machines, yet, as far as I can tell, the animals running around aren't. There is a Dark Soulsian Death Mechanic (DSDM) present here. When you die, you must retrieve your body (or not, the choice is yours), but I did not see any missing equipment, save for those chips that provide some boost. You gain back anything lost, along with some experience points (maybe only if you gained any since your last save), upon retrieval; or you can attempt to repair your body, at which point it becomes an ally, unless it's become corrupt from waiting too long, at which point you battle it, according to this RajmanGamingHD. The pause menu is mostly intuitive, but be aware that configuring your chips and pod program is located under skills, as opposed to under a tab labeled “Equipment.” When paused, you can view the map in greater detail, scroll around, and change the camera angle. What is really neat about this is that it will show nearby buildings and their heights relative to other buildings. Fast travel is available from one access point to another, but not unlocked until later. For now, you must go by foot or you can use animal bait to lure in a moose and then ride it, making traveling faster. But, if you pause to check the map, you cannot even access the menu. It just says "paused". It seems an oversight at the very least, but I figured you could dismount the animal, check the map, then mount it again. Nope. It sprints off immediately. There went my animal bait and my mount. I guess you could carry dozens of this animal bait item; they are pretty cheap compared to most other items in the shops (such as weapons and some upgrades). The graphics are absolutely stunning, and the environment is realistic to the point that you’ll stumble when traversing heavy brush or slide down slick sands in the desert. But, I did experience an issue with lag when playing at full screen, but no problems if windowed, even though my computer’s specs exceed the recommended system requirements. Some of the music that plays in the field and resistance camp that includes vocals does not fit too well with the post-apocalyptic, post-human theme. It just seems out of place, and it is music you might expect after you've won the battle, after you've defeated the aliens that invaded the earth. If, however, this music was meant to suggest quiet, withdrawn defeat, then it's more fitting given the current situation. Otherwise, what plays does fit this overarching despairful tone. Nier: Automata contains twenty-six different endings, which inevitably incentivizes those who want to see all possible conclusions; plus, you can beat the title multiple times, and you unlock certain features if you defeat it three times, according to the NieR Automata Wiki. But, the apparent lack of story, which drops off for a good while after the introductory level, is stinging, and you must have enough commitment to see past this. The combat is unique and, at times, refreshingly variegated gaming styles emerge from NeiR — from hack-and-slash to arcade-esque air fights — but enemies themselves show little variation and predictable movement. If you are looking for a hack-and-slash with extraordinary graphics and a fair amount of character customization, then it is likely you’ll enjoy playing this title.